A little fun with a vibrant photo I have been working on to make it into a representation of the wind. I am such a softie. My wife called to me earlier tonight. This hatching was sitting in our driveway under the tree that held its nest. Still blind and with no chance of ever learning the one thing it desperately needed to know – how to fly – its life is now likely measured in minutes. My heart aches for it even though I made no attempt to save it. I know I cannot. I can do two other things. I can offer up this photo as a reminder that nature, while not cruel (which would imply motive) is indifferent, whether to life or death or good or bad. For that reason, those of us who are capable of reason have a responsibility to exercise it. The second thing I can do is to offer up this photo as a memorial to this baby bird. It is sad that it died today. Nature may be indifferent, but we need not be. I joined most of my family for a Father’s Day together yesterday. 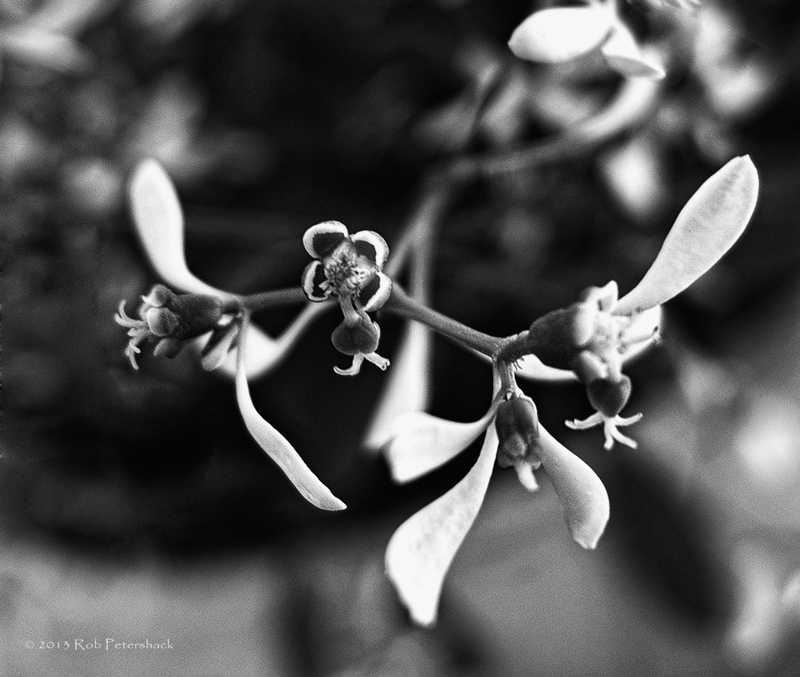 He has many beautiful flowers around his house, which I saw and photographed as I walked around the yard. I don’t know what plant these flowers are from. The plants were tall and very spindly. Each of the flowers were tiny (including the petals, I’ guess that each of the flowers shown here was about 1/4 inch (.635 cm) wide. This is a plant with plenty of curves and I hope you will enjoy viewing it. There are quite a few nice gardens maintained by our neighbors. This is a view of a part of one of them. This bleeding heart was actually horizontal when this shot was taken. I was just experimenting to see what I might get with the bleeding hearts on a windy day. This was a lucky shot. We don’t get much fog where these daffodils grow. Our cool wet spring gave us beautiful magnolias. I suspect the cool wet weather kept the bleeding heart plant going much longer than usual. It was apparently a very good year for the Magnolia and a less good year for the squirrels that often eat half or more of the blossoms (they hardly god any this year!). Another magnolia blossom. I’m probably overdoing this. This flower is under 1/4″ high and one of my favorites. Much more about the flower of this plant to come. I am going to start this as an ongoing project. I shoot many of my photos very close to home for a number of reasons. I am lucky in that we have quite an interesting yard at virtually any scale that I wish to address it. Our neighborhood is also nicely varied with my only real complaint being that there are so many trees that I don’t get good shots of thunderstorms from my home (poor me:). I thought this would be an interesting experiment. to keep track of and focus on photos that are taken nearby. We’ll see how well it works. I am still nowhere close to understanding WordPress and it seems various things I disappear after I have posted them or never actually get posted. Any suggestions on how to keep an ongoing “sticky” gallery page would be greatly appreciated. 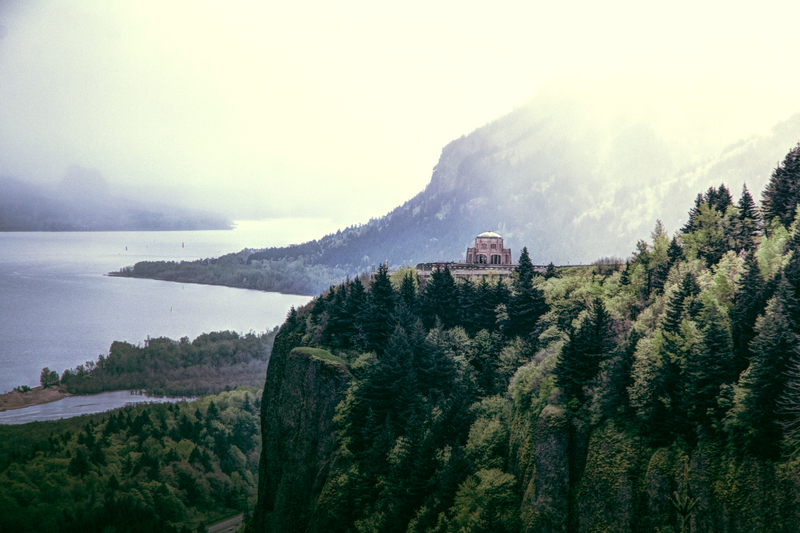 I posted a photo earlier today of the Vista House on the Columbia River Gorge. Here is a different perspective. I prefer this one because by taking a few steps to the left and getting up a little higher I got a better view of the background promontory and I liked the symmetry. This is a HDR composite of 3 images. From my little sample, it appears that the Columbia Gorge is the kind of place, particularly if you move at my pace, that you could easily spend a week photographing each month and it would still take years to really see it. Depending on where you are living around the world I hope you enjoy this photo of the Columbia River Gorge in the northwest U.S. as you go to bed or get up in the morning.